The Rav who passed away in his 90s was a moreh dasrah across two continents for over 70 years and wrote many seforim. This monster of a monument is actually an ohel. It has very nice haskomos, and a very lengthy hakdamah. The sefer linked above by Curious named Leshad Hashemen was printed while Rav Sprince was still in Europe in 1879. The copy in the link has a written dedication by his Son Yoseph Sprince from 1929 just a few months after his father passed away. My great-grandfather, Rabbi Solomon Dov beir Gedalya ha-Kohen Sprintz was born in 1846 in Mezhirichi (Ukraine) and studied in Krynki (Poland) and Volozhin (Minsk Prov.). He was ordained by R. Barukh Mordecai Lipschitz of Novogrudok (Belarus) and Siedlce (Poland), R. Reuben Levin of Nesvizh (Minsk Prov. ), and R. Hayyim Zalman of Mir (Belarus). He served with several congregations in Poland (which included parts of Belarus at the time) possibly in the Pinsk area. (My grandfather told my father he grew up in Pinsk.) In 1889, the Rabbi took a position with a congregation in Montmartre (a district of Paris), France, and became close friends with Zadoc Kahn, the Grand Rabbi of France, and became associated with the incipient Zionist movement. Rabbi Sprintz and his wife, Freida, arrived in New York City (Ellis Island) on March 29, 1898, and lived briefly in Brooklyn, New York. Shortly thereafter, he became Rabbi at B’nai Israel, an Orthodox congregation in Paterson, New Jersey. In 1899, he had relocated to Portland, Maine and accepted the rabbinical post at Sharith Israel, after hearing Portland described as the “Jerusalem of America”. He was described as the Chief Rabbi of Portland. I have incomplete records from 1909 until his death on May 25 or 27, 1929. It appears that he lived in Boston during this period. In 1912, the Rabbi published a book, Kerem Shlomo. The cover shows his address as 129 Chelsea Street, East Boston. A municipal record shows him as Rabbi of Khal Linas Hatzedek (Linas Azedik), 77 Chelsea Street, in 1922. A local historical document states that Linas Azedik was founded around 1915. Given the nearby street address, it can be guessed that the Rabbi was involved with its founding. However Rabbi Sprintz was buried in the Shara Tfilo section of the Baker Street Jewish Cemetery which means he was probably affiliated with that congregation at some point. There is sketchy information regarding Shara Tfilio. It might have been in Roxbury during the 1920s. The name might also relate to his original congregation in Portland, Sharith Israel which later merged into Shaary Tphiloh around 1904. Joseph Sprince, Please cotact me. I wish to ask you somthing regardin Leshad HaShamen. 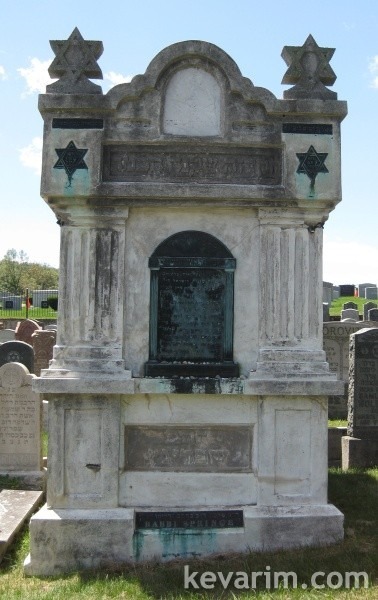 st. Beth El Cemetery, He is buried not far from the Rav His sister Esther Mirium Glazer, too. Now the grandfather’s last name is not known? A Morris Chojet is on the board of Beth Israel in 1900-1910-1915 more or less. I have looked for relatives. cHIEF rABBI OF rIGA. tHEY HAD TO KNOW EACH OTHER. Please add conversation in any component of their lives. thank you. Ut was great pleadure conversing while i was in springfield. At beth jacob.now i will call city hall to get death crrt. Comment is that my grandpa abraham reuben, sister miriam esyher, husband josrph meyer were born in Riga. If relatived R Shlo.o Dov HaCihen Sprince are reading. I wish to speak posibly of Beth Istarl and. Khal Libas as Riga Latvians and shuls. Nov 7 2018 I Y’H.